Capt Jim Klopfer offers a unique opportunity for anglers seeking something different on his Sarasota river fishing charters. He is the only guide in the area that provides this service. 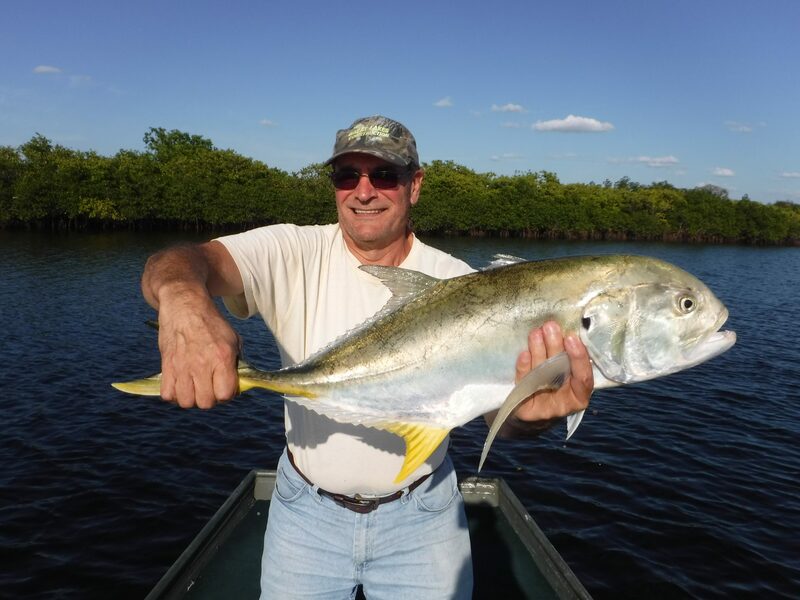 This is a trip for more experienced anglers with some casting skill and patience, it is a “quality over quantity” situation as there is always the chance to catch a trophy snook. The scenery is definitely part of the overall experience as clients enjoy a peaceful day drifting down the river and enjoying “old Florida” as they cast lures toward shoreline structure. The three rivers that are primarily fished are the Myakka River, Braden River, and Manatee River. All three start off as lakes, then a dam, then the tidal, brackish portion of the river which holds snook, bass, and other species. All are about a 45 minute drive from the Sarasota beaches. Three waters are visited on Sarasota river fishing charters. The Myakka River is a “Florida Wild and Scenic River”. This means limited access and development, which equates to some very interesting scenery. 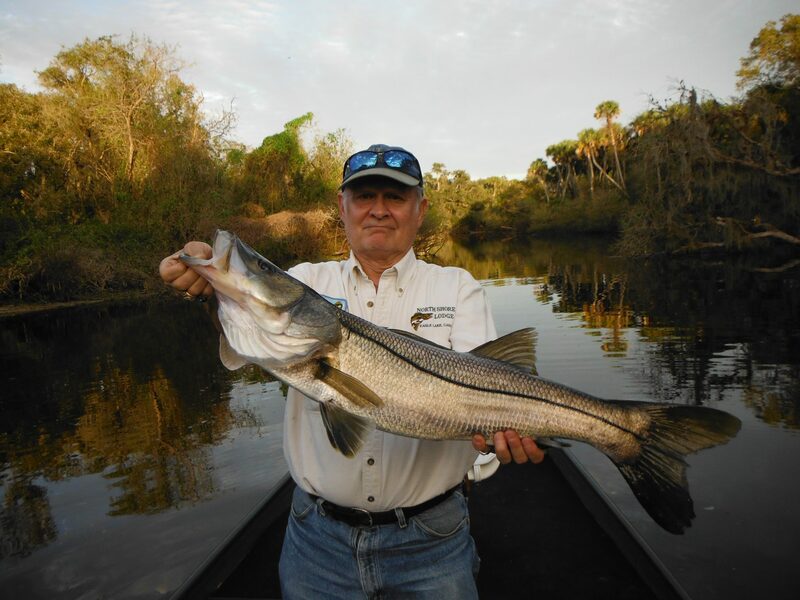 The Myakka River offers the best chance for giant snook. Some years the bass population is pretty good, but it varies. Bird life is abundant in the winter, with gators seen on most days. The Braden River runs through a more developed area of Bradenton and is more of a saltwater situation. It is a short river and is close to Tampa Bay, resulting in snook, jacks, and reds only having to migrate a short distance. It is fairly developed with a lot of houses and docks, but can offer some great fishing. Schools of jack crevelle move in and are fairly reliable, offering great sport for spin and fly anglers. The Manatee River flows east from Tampa Bay and is a mix of the other two. It has more development than the Myakka but feels a bit more remote than the Braden. It also offers the most variety as saltwater species such as snook, reds, jacks, juvenile tarpon, snapper, and ladyfish are caught along with freshwater fish including largemouth bass, gar, catfish, bream, and sunshine bass (a white bass hybrid). There are also options for visitors to do some true freshwater fishing on Sarasota river fishing charters in area lakes and rivers. 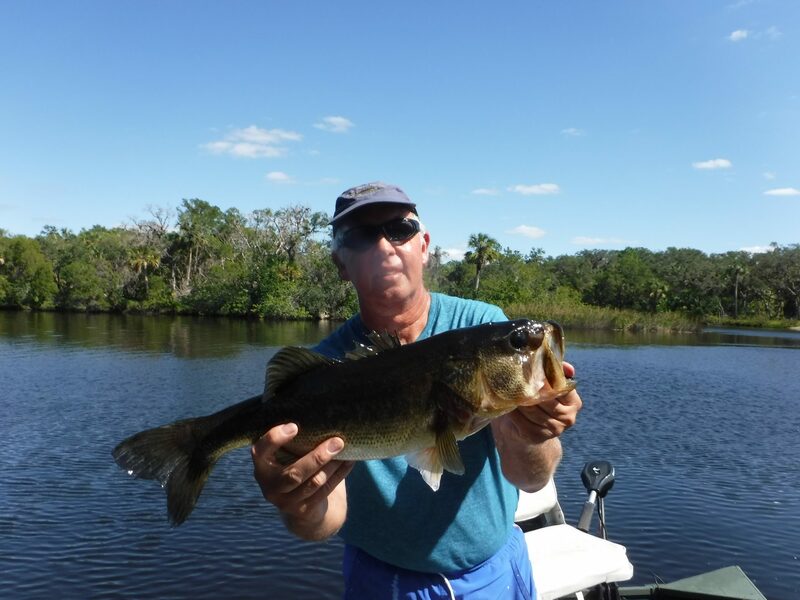 Lake Manatee, Upper Myakka Lake, and the Braden River can have some good fishing for largemouth bass, bream (bluegill, sunfish, etc), catfish, and other species. This is not something that I get to do all that often, so it is hard to stay on top of it, bit I am more than willing to try my best for clients desiring that experience. Due to the shallow water and primitive launching ramps, a 14′ Alumacraft Jon boat is used on these charters. This limits the number of anglers to one or two. Rapala plugs are most often used as they allow anglers to cover a lot of water and trigger reaction bites. Fly fishermen will do well with an 8wt and an intermediate sink tip line and a Clouser pattern.